Now, more than ever, it is critical for forest industry businesses of all shapes and sizes to re-evaluate their business models. Be honest—is your business a price maker or a price taker? Until the standard model in this business becomes one of price making rather than price taking, I fear that it will once again bog down into the same old pattern of too many hounds chasing one rabbit. I am very concerned that with better prospects on the horizon, the industry will return to its old habits. That’s especially so when I read statements—such as in the Future Bio-Pathways Initiative report—that for the forestry sector to have a strong presence in the evolving bio-economy, it must first ensure that the primary commodity sector is strong. Okay, I buy that. What I’m concerned about is that some in the industry will take these types of statements as a signal that Future Bio-Pathways was an interesting academic exercise, but now we can shelve it and get back to making as many 2 x 4’s and OSB panels as we can for export to the U.S.
It’s obvious to most that the global market for forest products is far different today than it was pre-2008. The American housing market has tanked, the pulp and paper industry has gone south, literally, and China has become the dominant global economic player. It’s now the B.C. forest industry’s largest customer. Through February, year-to-date exports of softwood lumber exports to China from B.C. rose by a stunning 138 per cent, to reach $138 million. In 2010, lumber export volumes to China more than doubled to $668 million. India has recently opened its market to imports of spruce lumber from Canada, creating another new market for Canadian lumber. The wood pellet export market is booming, and Canada is on the brink of building the world’s first commercial scale nanocrystalline cellulose production plant. Three cross-laminated timber (CLT) plants are being built to supply product to compete with steel and concrete in the multi-storey construction market. Finally, FPInnovations has made a breakthrough with industry partner Tolko Industries, developing a method to allow OSB producers to produce a variety of oriented strandboard products on a single forming line, solving one of the biggest conundrums facing that industry sector today. So… is your business model up-to-date to face the future or is it stuck in the 1980s? Never before have individual Canadian forest companies been handed a better opportunity to develop a serious diversification strategy. Unlike the past, they have a genuine opportunity to seriously evaluate what products will deliver the greatest profit margin in the current economic climate, based on the development of new products and new markets to augment traditional products and markets. Can commodity-driven sawmills and panelboard plants be tweaked to react quickly to produce higher value and higher demand products? What it will take is a combination of flexible manufacturing facilities and knocking on doors to discover customer requirements for business to truly evolve into price makers for their products rather than price takers, as has so often been the case with so many chasing the American housing market. Another resource underutilized by most Canadian wood product manufacturers is the Internet. Businesses should take a serious look at programs like the Canada Get Your Business Online program being offered by a consortium of companies including Google Canada, Yola.com, the Canadian Internet Registration Authority and several banks. Google is giving out websites and domain names, with a goal of establishing at least 100,000 Canadian businesses online. All costs associated with setting up the site and obtaining the domain name will be paid by Google. So if your company is selling forest products of any kind, there is no excuse not to use the Internet to market your products. Consortium partner Yola.com will even help you design a professional website for a modest fee. The Internet makes it easy for the world to come knocking on your door, and developing an online marketing strategy is another step toward business diversification. The need to evaluate forest industry business models is not limited to product manufacturers. The relationship between loggers and forest companies desperately needs a re-evaluation. I’m surprised that more companies have not considered offering qualified loggers something called ‘Evergreen’ contracts. These essentially provide loggers with longer term contracts with the prospect of guaranteed renewal as long as both the contractor and forest company have met contractual obligations. Based on my contact with Canadian loggers, a much longer contractual arrangement than one season to the next is needed. How can forest companies expect loggers to invest in sturdier, more productive, more fuel efficient equipment if they can’t offer loggers more than a seasonal contract? How can they expect to attract more young people to the industry if they can’t see a long term future in it? What bank is going to offer reasonable loan terms for equipment purchases in such a high risk environment? 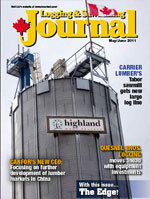 The time for a much more respectful and professional relationship between loggers and clients is long overdue. My hope is that businesses will do some serious soul searching because I’m really tired of hearing that same old comment that profit margins are thin, at best, in the forest industry. To me, that situation is somewhat self-inflicted if industry constantly allows someone else to set the price.